Samia cynthia - This Saturniid moth is from East Asia but was introduced to Europe and USA during the 20th century for the silk industry. here it was photographed at a open field in dusk. I'm sure that the moth loves your camera and take the most beautiful pose. Great picture, very good colours and composition. Fantastic shott of a beautiful moth. Beautiful moth. I like composition, details and colors very much. Oz, what a great opportunity for such a wonderful shot! The detail and colors are really great...beautiful work! Very good DOF and details! A great capture of this cynthia , great BG , Sharpness and lighting , feels like this guy wanted his pic to be taken by you , very well done. Hello Oz, amazing shot , great colors and sharpness. I like the blurred BG and your composition, very well done for this capture of Samia cynthia, best regards, Didier. this is an excellent butterfly shot. Great POV, sharpness, details and composition. Great colours and very nice bg too. Thank you for posting. A brilliant moth and a superb shot. Really this moth has shown everything, on what it is capable. Sharpness, details and composition are great too. A little confuses only a white spot above a moth. Perhaps, it would be necessary to correct (or change) this white tone. But that is a matter of taste. A great shot, well composed with nicely saturated colours and good light. Crisp, clear and sharp with great POV. Excellent camera work. TFS. Another astonishing moth! Shape and color are superb and compostion is at level of the main subject. Very good contribution to TN! 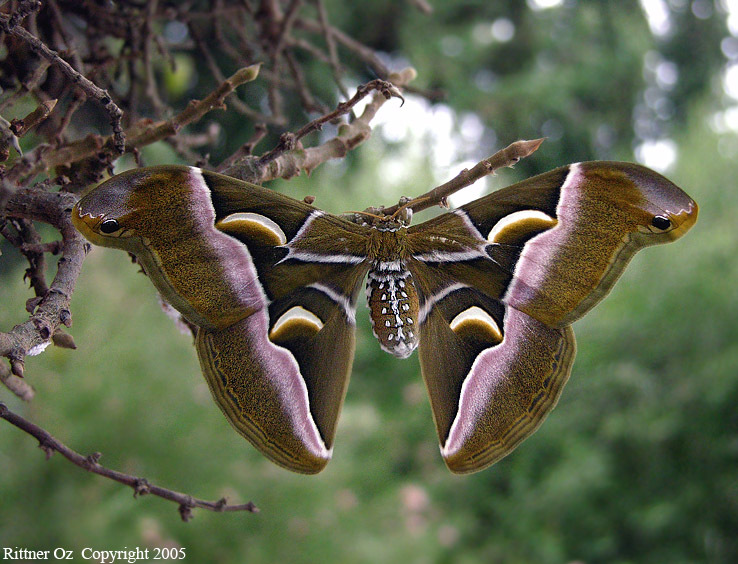 Oz, these moths are so beautiful indeed! Another great shot from you! This one has interesting bg also! Very beautiful and big moth Oz! Excellent POV with wings wide open! Good on colour and BG! WoW, this is a moth! and what a lovely shot you have managed. It is a very pleasant image, with great prespective, colours and details. The subject and pose are just super! TFS.